In 2017, numerous junior athletes had remarkable results in international competitions. 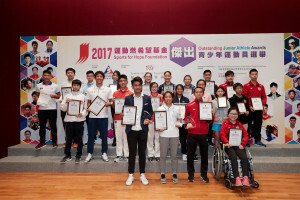 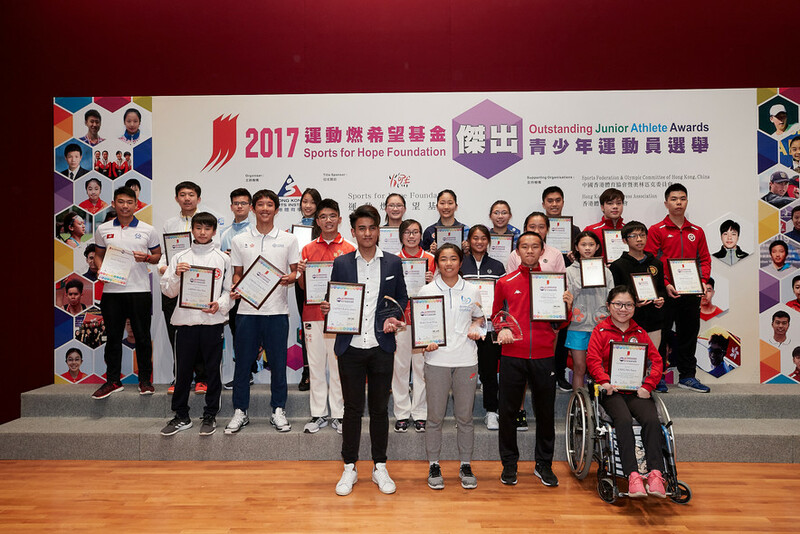 Amongst them, three athletes namely Robbie James Capito (Billiards Sports), Mak Cheuk-wing (Windsurfing) and Yim Ching-hei (Athletics – Hong Kong Sports Association for Persons with Intellectual Disability), had the best sporting results and were awarded the Most Outstanding Junior Athletes of 2017. 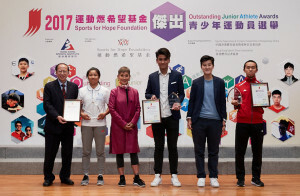 Following the success in 2016, Mak was presented the same title again this year as she completed the girls U15 event at the 2017 Techno 293 World Championships with a silver medal, being the first Hong Kong windsurfer to win a medal in the junior events of the World Championships two years in a row. 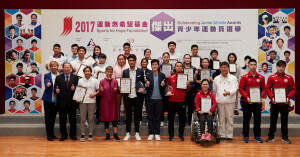 Besides, she also came fifth in the Youth Women Class Windsurfing event at the 2017 Techno 293 Plus World Championships. 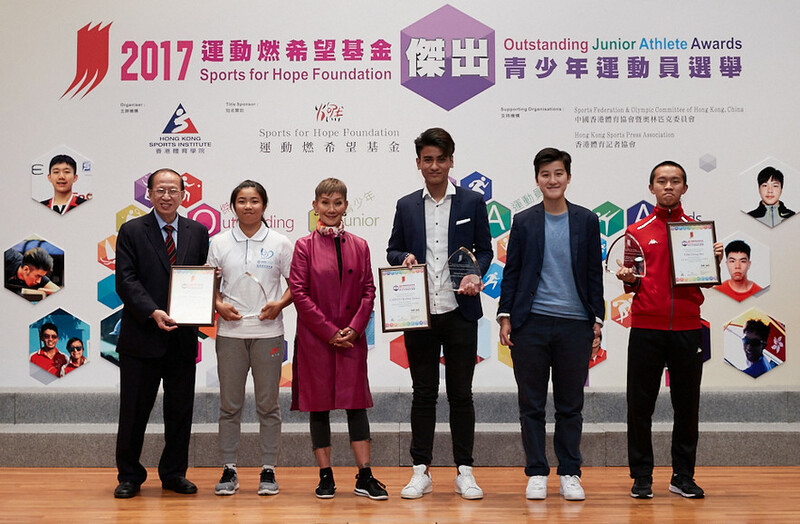 On the other hand, Capito and Yim (both the first-time annual award winners) also achieved remarkable results last year. Capito claimed a gold medal in Boys’ Single at the Asian Pool Championship 2017 and a silver in Boy’s U17 category at the 2017 World Junior 9-ball Championships, while Yim brought home a gold medal in the Boys’ T20 400m event at the INAS Athletics Championships. 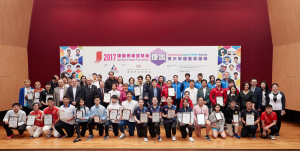 The recipients of this quarter are Ko Shing-hei (Badminton), Robbie James Capito (Billiard Sports), Chan Yin-yau (Equestrian), Cheng Hui-pan (Karatedo), Ha Yat-ting and Po Ting-jun (Lawn Bowls) (Lawn Bowls), Chau Wing-sze, Lee Ka-yee and Wong Chin-yau (Table Tennis), Wong Hoi-ki and Wong Hong-yi (Tennis), Cheng Ching-yin and Mak Cheuk-wing (Windsurfing), Hui Ka-chun (Swimming – Hong Kong Sports Association for Persons with Intellectual Disability), Wan Wai-lok (Table Tennis – Hong Kong Sports Association for Persons with Intellectual Disability) and Cheung Yuen (Boccia – Hong Kong Paralympic Committee & Sports Association for the Physically Disabled).